Train You Pup offers the greater Dayton area with a board and train program that is customized to your dogs needs. Most board and train programs utilize shock collars to force dogs into behaviors. Train Your Pup is a positive reinforcement training facility. This means no shock, prong, or choker collars. Train Your Pup’s board and train program is performed by multiple certified trainers in a variety of situations. This way it is more likely that the dog does not revert back to unwanted behaviors. This program is designed for the family who wants an experienced dog trainer to take the lead in training. Our 7 day program starts with a short consultation in the home to discuss the problems and desired outcomes. After seven days at the Train Your Pup facility owner will receive two private sessions with the lead trainer. 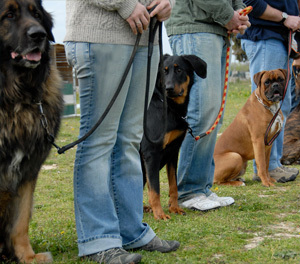 Our instructors will work with your dog at home, parks, veterinarian hospitals, pet stores; wherever issues might occur. Detailed training notes will be taken for each training session. Not only will your dog receive training, but will also have an opportunity to play in daycare everyday. You and your pup can benefit from our experience. Be it for obedience, aggression, anxiety or other unwanted behaviors, our positive training methods will help all members of your family achieve the goal of a harmonious and happy household. Contact our experienced trainer to schedule an in-home assessment today. We offer collective training for dogs in Moraine, Dayton, Centerville, Bellbrook, Springboro, Lebanon, and the surrounding areas in Ohio.